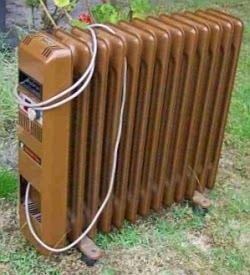 When Is An Oil Heater Not An Oil Heater? Have you ever owned an old oil filled radiator? They weigh a ton right? Well take a look at the new oil filled heaters in the shops right now. They still have the same kWh ratings such as 2000W. Now if you remember how heavy those [back breaking] old oil heaters were, these new ones are light as a feather! With the common modern manufacturing principle of using less metal, there is one obvious other big difference. There is simply a lot less oil! The inner volume of the heater is far less along with the oil inside the fins of the heater. Thus the heated oil will be hot for a far shorter period of time. Meaning the heater is on more and is moving more towards a normal convection heater and away from the old principles of how an oil heater works and performs. Wikipedia reports an oil heater as being designed to use the oil as a heat reservoir, the heating element heats the oil, which remains warm for a LONG period of time while the heat is transferred to the metal wall through convection, through the walls via conduction, then to the surroundings via convection and radiation. And we would agree with this 100%. So why reduce the oil content, which affects the way the heater works? Well one reason for the manufacturers change is the old oil heaters take to long to heat up! And modern customers do not like this fact! Interestingly this design change seems to have taken away the advantage of the oil itself! Surely the marketing is incorrect here where if you want fast heat, go for a fan heater and not an oil heater. Which when of the old design of having more oil, according to our in-house tests used far less electricity than the new light as a feather oil radiators. Read more about oil filled radiators on WIKIPEDIA.